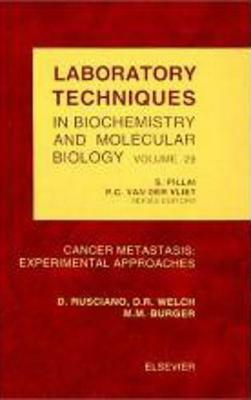 The book describes most of the methods that are currently used in metastasis research. Both in vivo and in vitro protocols are illustrated, so that the metastatic process can be either analysed as a whole, or single events addressed separately. Each method is described in the frame of the metastatic process, therefore its significance and its limitations in the context of metastasis are always taken into account. Whenever possible, several alternative procedures are reported per each experimental issue, so that the researcher can choose the one that better suits her/his needs and possibilities. During the past 30 years a big effort has been made to elucidate the molecular mechanisms of cancer metastatis, the leading cause of death for cancer patients. A considerable number of assays have been set up, that can be used to address specific questions concerning the single metastatic steps, or can be applied to develop and test drugs specifically interfering with selected events during the metastatic spread. This book contains an exhaustive description of most of the methods and their rationale, that are currently used in metastatic research, both to analyse metastasis in its entirety (in vivo models), or to dissect the single steps of the metastatic process (in vitro assays).